This study aims at improving calibration accuracy, which is the match between estimated performance and actual performance. In our experiment, one hundred and twenty-seven university students read texts and learned definitions. The students recalled these definitions during a test and made performance judgements. After recalling their definitions half of the students received full-definition standards, stating what the correct definition should have been. The other half of the students received idea-unit standards: The correct definition was parsed into units that had to be present. Providing standards improved calibration accuracy not only on current texts, but also on new, subsequent texts. Especially the calibration of low performing students benefitted from receiving both idea-unit and full-definition standards. Furthermore, over multiple texts, students who received idea-unit standards benefitted more than students receiving full-definition standards. 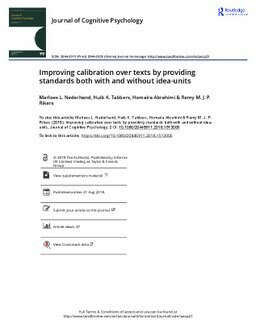 This study is among the first to show the effect of standards on calibration on new texts and underscores the importance of self-testing.